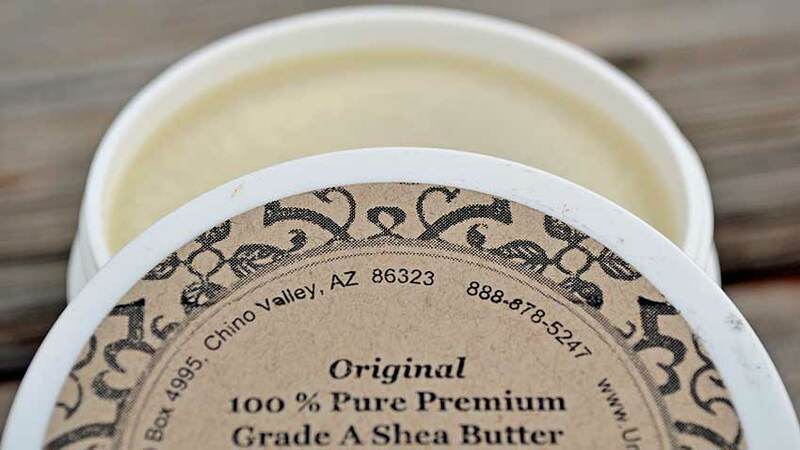 Shea butter might be the world’s first skin care cream, one of the Queen of Sheba’s beauty secrets. This original, hand-crafted butter is high in vitamin A and E that heal and moisturize the skin. Its healing properties are well researched and documented for chapping, abrasions and insect bites. Recent research shows its effectiveness in healing cuts, surgical incisions and minimizing tattoo scarring. Our Shea butter is hand-made. 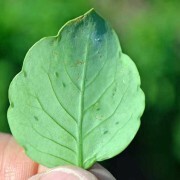 There are no chemical extraction, bleaching or whitening agents stripping its healing properties. Commercial pure white or deep yellow Shea butter uses carcinogenic hexane or other petroleum solvents. After extraction, it is refined, bleached and deodorized which destroys any healing properties it had. 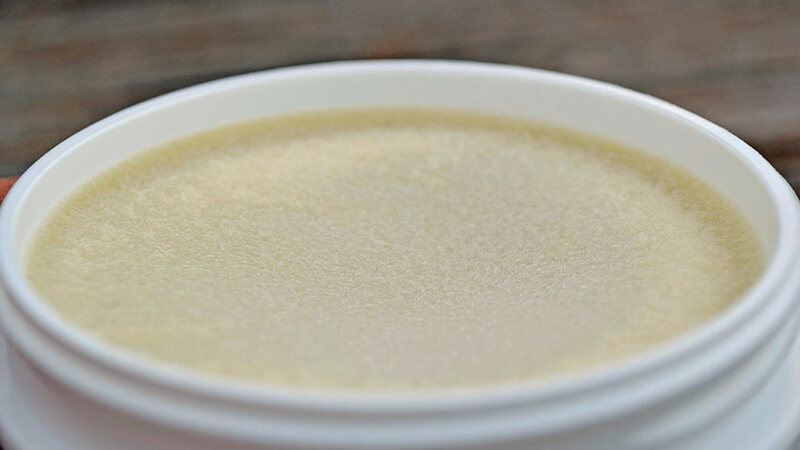 Here’s what high quality Shea butter looks like and how to use it! This is the correct color for 100% pure, Grade A Shea butter. 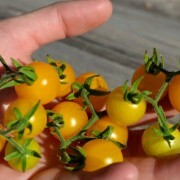 It should be a very light, almost creamy pale yellow. You should notice an aroma when the lid is opened, but it should never have an offensive or unpleasant odor. 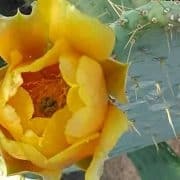 The aroma guarantees you the healing qualities are still there! It should never be gray or dull, but not a bright yellow either. Both colors tell you the Shea has been chemically extracted, with the bright yellow meaning extra coloring has been added to conceal the gray. 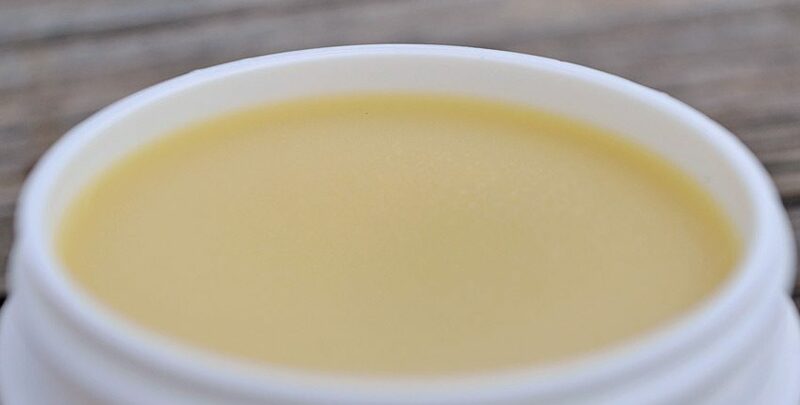 Happy Feet Shea butter will be a bit more yellow with a smoother, creamier texture with an herbal or garlic aroma. 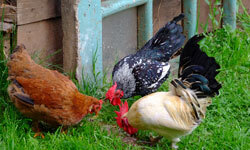 Some will notice the herbal essential oils, while others pick up the garlic scent first. 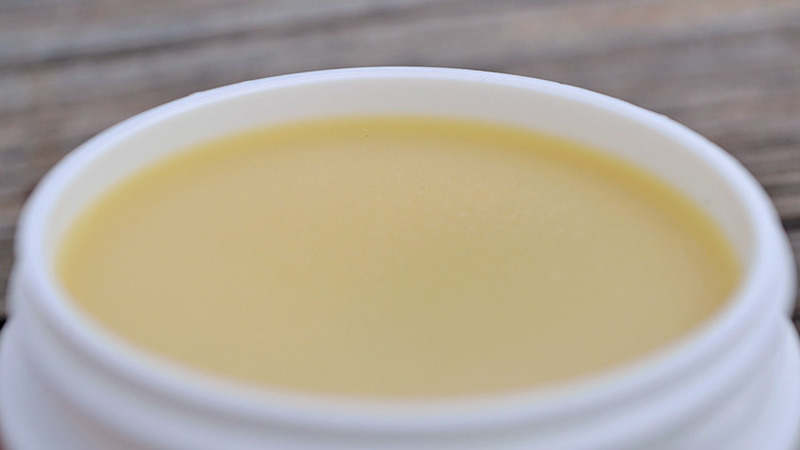 Using our pure Shea butter is simple and takes just a couple of minutes. It is a solid at room temperature, unlike any lotion or moisturizer on the market. A very small amount – tiny, actually – is all that is needed. 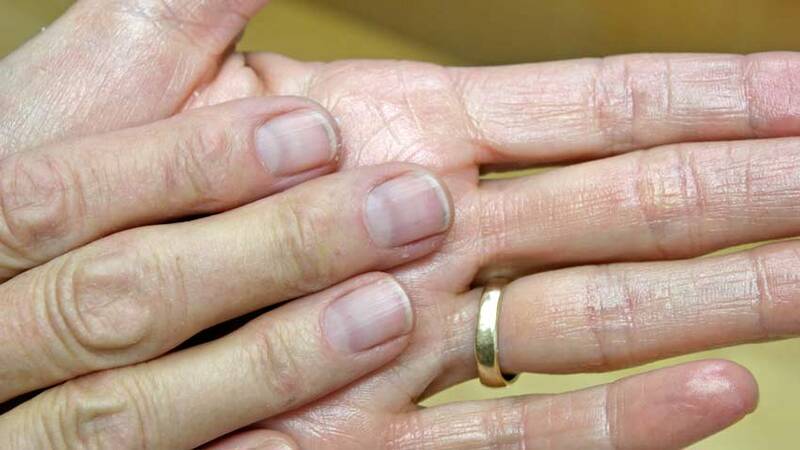 If you are naturally warm and have warm hands, just rest your finger on the surface for a few seconds. The Shea butter will melt and be ready to work into your skin. 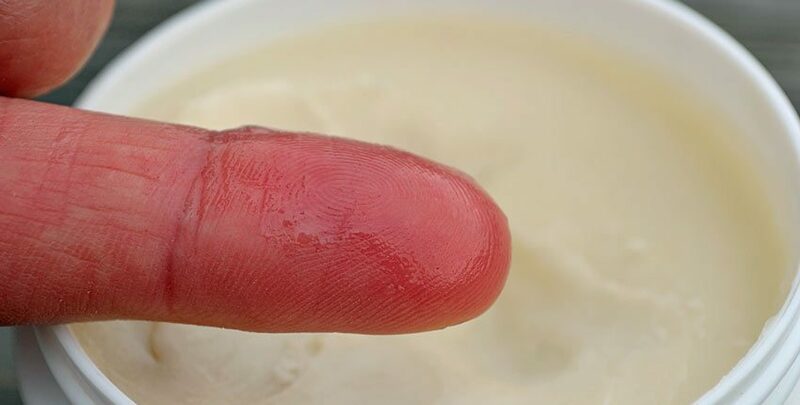 After a few seconds you will see and feel the melted Shea butter on your finger, like this. 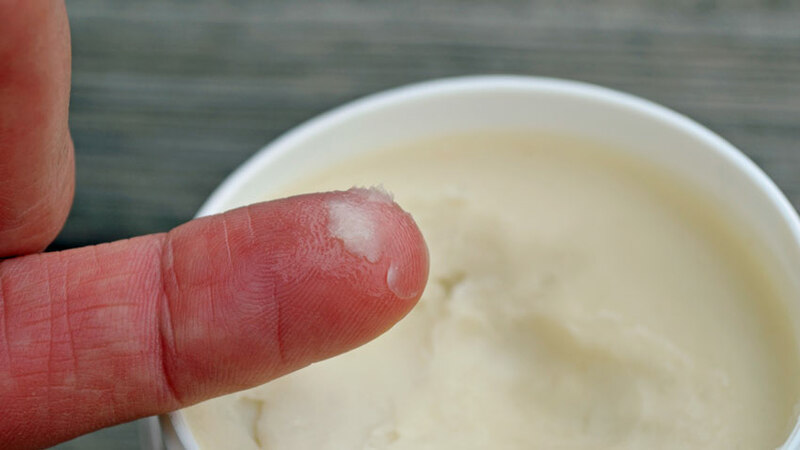 Pure Shea butter is so concentrated, all you do is rub this tiny amount into your hands once or twice a day! 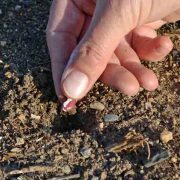 For those who aren’t “warm” people and don’t have warm hands, just scoop a teeny bit up, rub it between your palms and work it in. This is about how much Cindy uses each time she applies Shea butter. You can see why one jar lasts about 9 months! 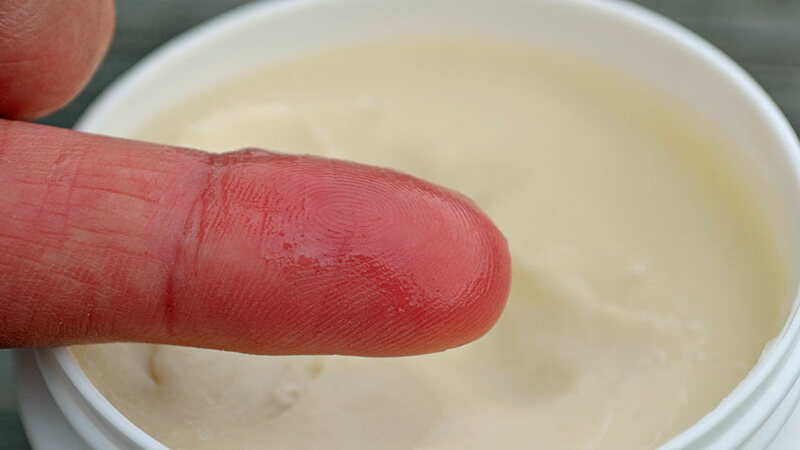 The dab of Shea butter continues melting on the palm, especially if rubbed together and then worked into the skin. It might take a couple of small applications to get your hands completely moisturized, but it is better than starting with too much! 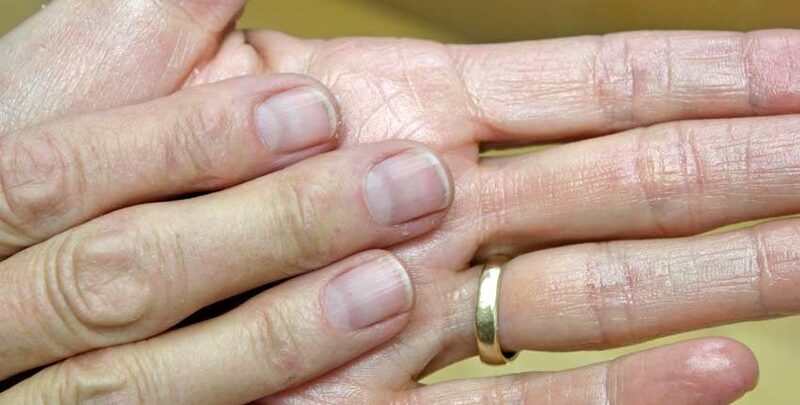 Eileen has colder hands and uses the Shea butter each night to heal and moisturize her hands from gardening, working with her horses and general outside exposure. She starts with a dab on the finger and puts it on her palms, then rubs them together vigorously to heat and melt the Shea butter. Once it has melted and her palms have turned shiny, she rubs it in. 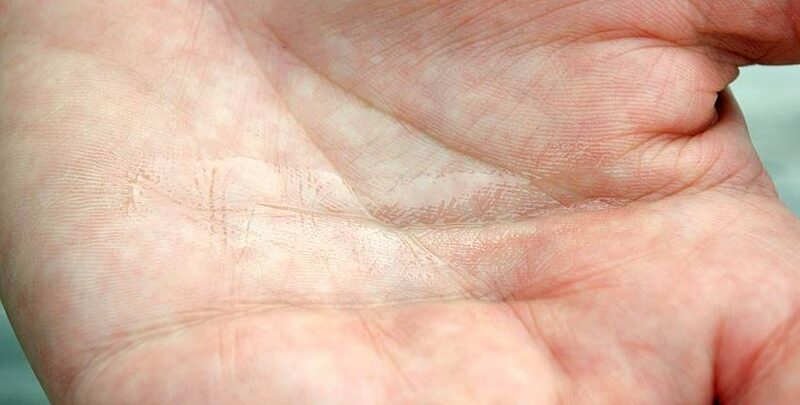 The sheen on her palm is easily seen, while the back of her fingers don’t have any shine. If she has extra, she will work that into her forearms as needed. She has found that daily applications during the winter minimizes dry, itchy and irritated skin. 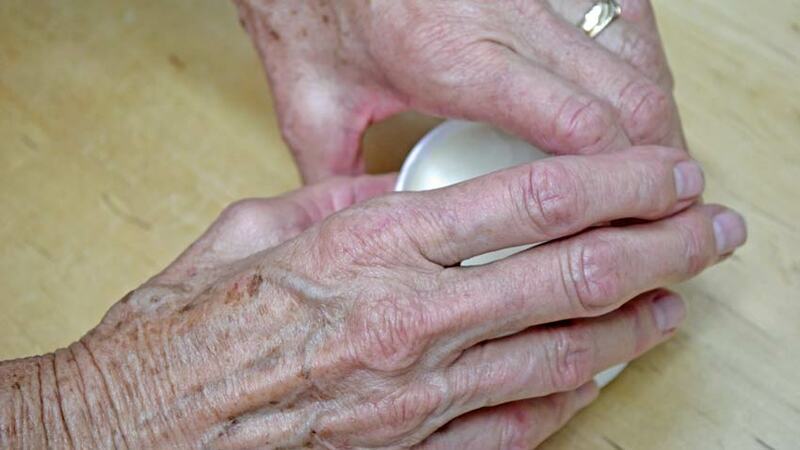 Pay particular attention to any rough spots on your hands, working extra into those spots. 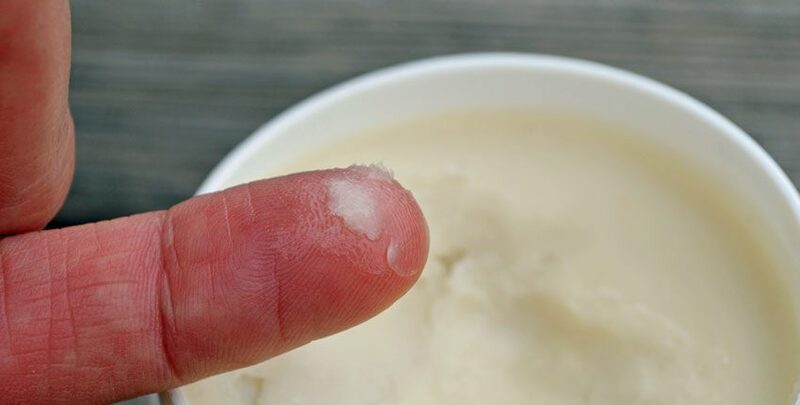 My thumbs split at the tips during winter, just under the thumbnail, so I spend extra time working the Shea butter in to minimize the cracking. After 3 – 5 minutes the Shea butter absorbs into your skin and leaves little to no shine. This shows it is working to heal and moisturize your skin! Even with Eileen’s cool skin, there is almost no shine left after 5 minutes. There is no greasy feeling, unlike several moisturizing lotions on the market. 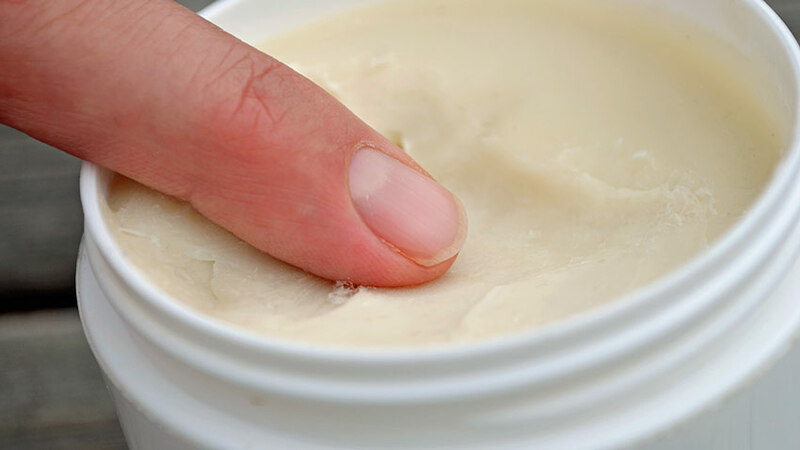 Shea butter is different than a lotion that you pump out, rub in and disappears almost instantly. It is a solid needing to be warmed up to be worked into the skin and there is no water to evaporate like with lotion. Are you surprised to find that almost all lotion is mostly water? 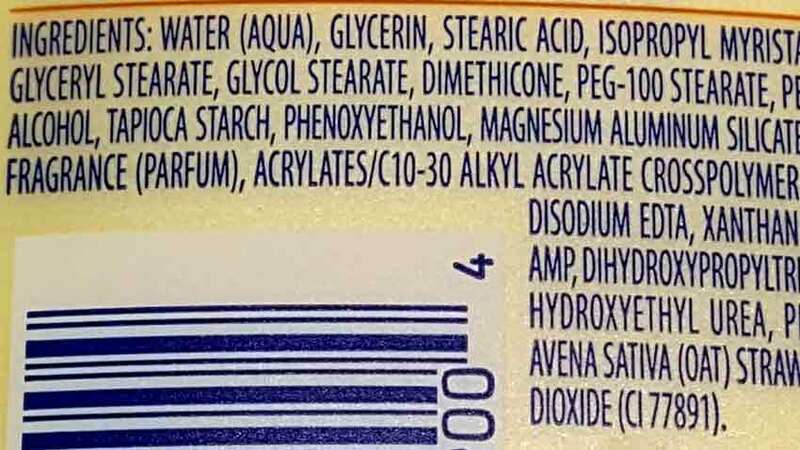 Look at the ingredients label to see for yourself! 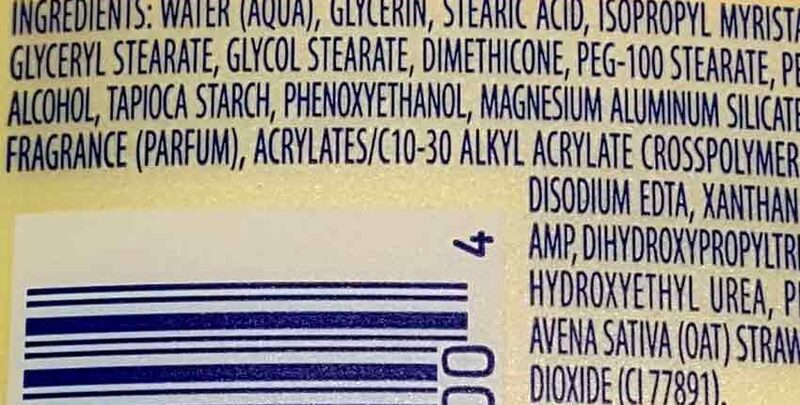 Ingredients are listed in order of amount; the first ingredient is the largest one. Water is a universal solvent, making it easier to form a cream that can be pumped or squirted out and rubbed in quickly. Don’t get me wrong, we also use regular lotion in our daily lives as a quick fix after washing our hands. This is why we use our Shea butter in the evening, a little before bed when we have a few minutes and it can absorb fully. The next morning our hands, feet, elbows or face feel smoother and healthier! 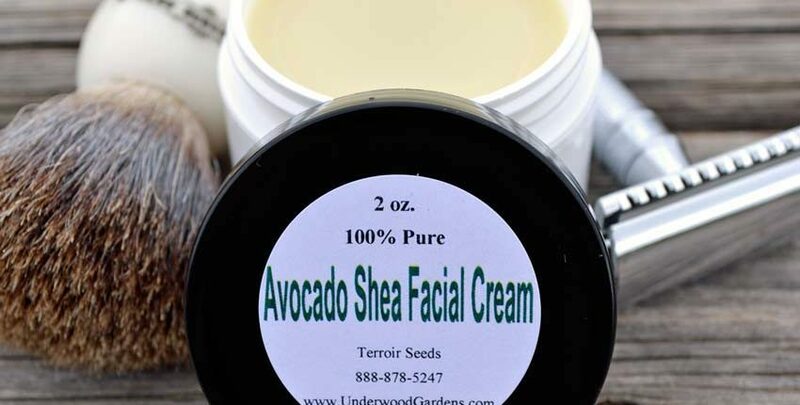 For shaving, our Avocado Shea Facial Cream is just wonderful! A pre-shave application moisturizes tough or coarse beards and lubricates sensitive faces. If your face is chapped or wind-burned use it before shaving for a much more comfortable and close shave without razor burn. Working a small amount into your face after a shave helps your skin for the rest of the day. 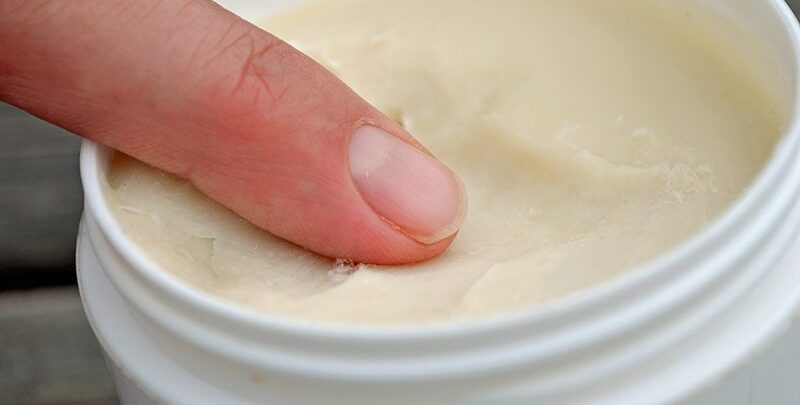 Even less is needed post-shave than for hands, so put some very warm water into the container for a second or two, melting the facial cream just a bit. Then dab your finger on the surface, picking up a very small amount and massaging it into your face. The slight sheen disappears in a few minutes. Avocado Shea is also excellent as a daily facial moisturizer, no matter if you shave or not! Happy Feet will do just as its name says – make your tired, aching and sore feet happy again! The combination of pure Shea butter, capsaicin, garlic oil, lavender, eucalyptus, peppermint and tea tree essential oils work wonders on feet. We had our doubts initially as to the effectiveness of Happy Feet. After all, there are hundreds of “miracle” foot rubs and creams promising to make our feet feel better! The first time we seriously tried it our feet were tired and sore from standing and working on them all day on a concrete floor. Mine were just aching, tired and slightly swollen, while Cindy’s were throbbing and her heels stung. We figured that we had nothing to lose and liberally applied Happy Feet, put on socks and went to sleep. The next morning we both awoke to rested and restored feet. We both remarked that it felt like our feet had been massaged that night, feeling much better than we had anticipated. Me feet didn’t feel any residual aches or soreness from the day before and Cindy’s weren’t throbbing anymore. We now take Happy Feet with us whenever we travel and especially for shows or anytime we know we’ll be on our feet for most of the day. 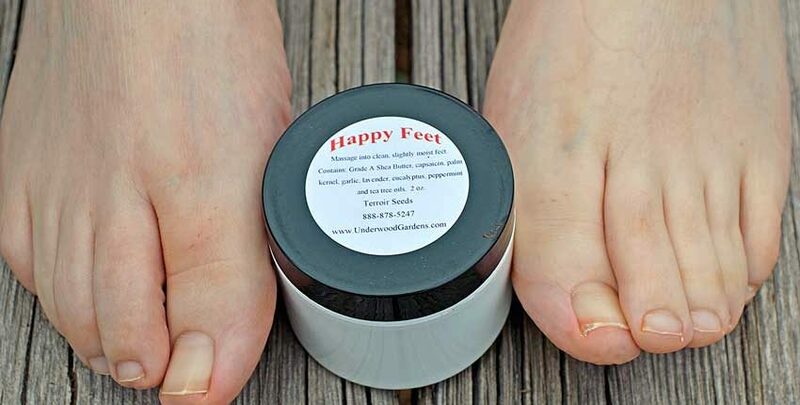 Our customers say a small application in the morning helps keep your feet feeling better all day long. 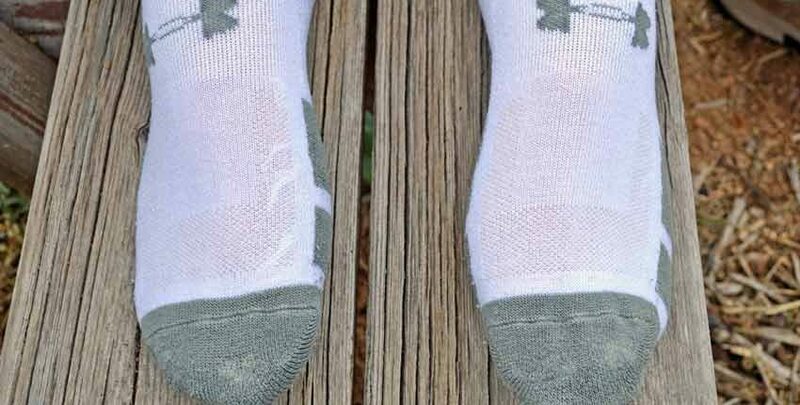 Start with a small amount and work it thoroughly into your feet. 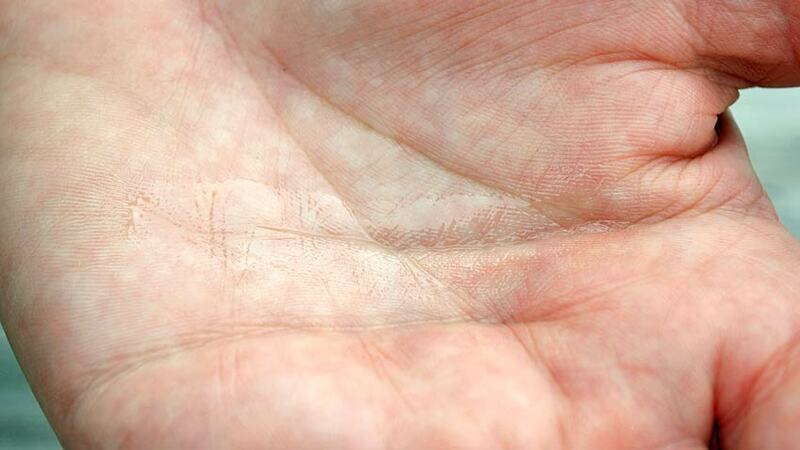 Paying particular attention to the sore areas, where you have cracks, splitting or calluses. 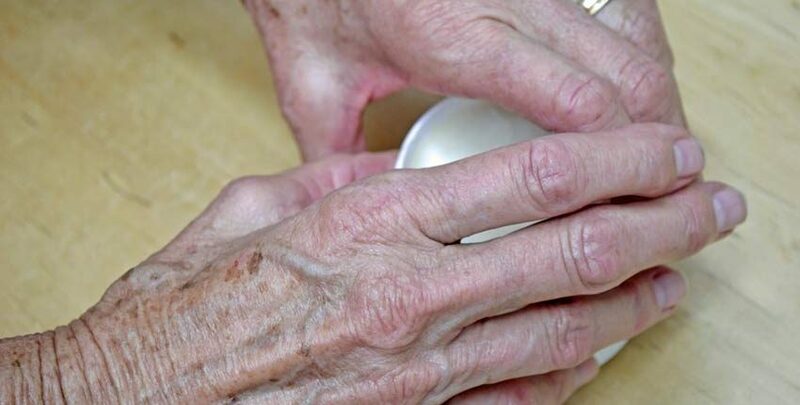 We use it liberally, applying more than we normally would to our hands. It is best to apply it just before bed so your feet have all night to absorb the cream, rest and heal. 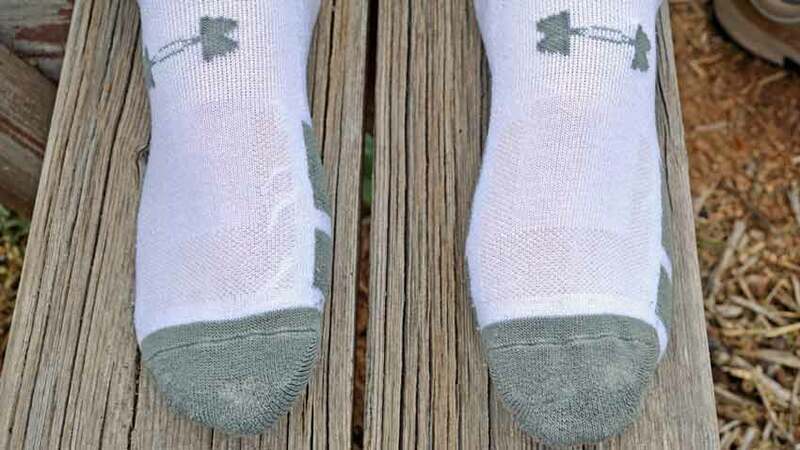 Once you’ve worked the cream in, put on socks and get ready for bed. Make sure to wash your hands well, as you don’t want the scent of essential oils and garlic on them in the morning! You’ll find you sleep better and wake refreshed with feet that feel much better than you thought they might! 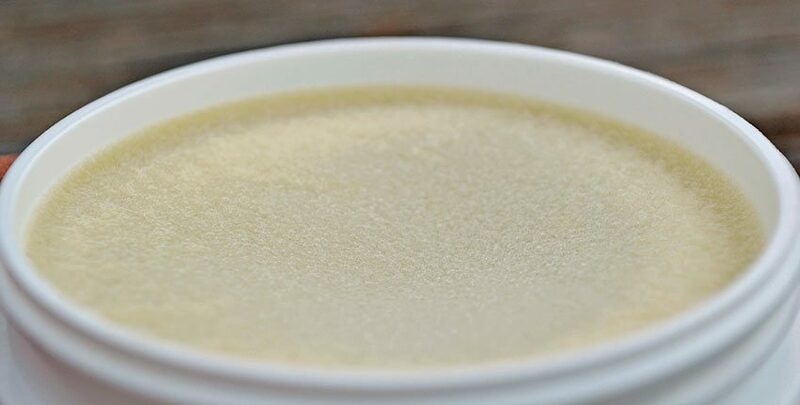 Learn why our Shea butter is the finest available and what it takes to make in Shea Butter – Healing and Moisturizing Miracle!